The full outline for Special Operation 4 of Ghost Recon Wildlands Year 2 was made available by Ubisoft recently. Special Operation 4 is the last free update for Wildlands Year 2 and adds a new PvE mode, new PvP class and a range of updates, changes and features. 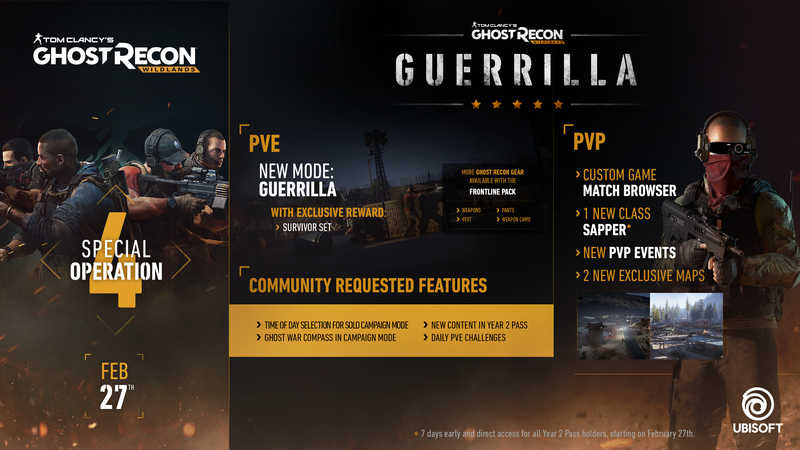 The new PvE mode, dubbed Guerrilla Mode, is a kind of Horde Mode using the mechanics of Ghost Recon Wildlands as a base. The new PvP class is the Sapper. A Support class character, the Sapper works against the enemy team to slow them down on approach. expands on the game’s PvE experience with a unique challenge testing players’ endurance, skills and tactics. Solo or up to four Ghosts, players will need to defend key locations against increasingly deadly waves of Cartel and Unidad members. After each completed wave, they will have the opportunity to purchase and upgrade weapons, skills and attachments with resources gathered from dead enemies. Each choice will be impactful and strategy will be essential to overcome the challenge. The Sapper deploys a drone that fires special mines that drain enemy stamina, slowing them down and making it hard for them to rush the opposing team. In addition, there are two new PvP maps and two new PvP events. The new events are Arms Race and Danger Zone. In Arms Race, players spawn with only a pistol and need to scavenge for other weapons on the map. It sounds a bit like a Battle Royale mode, though more focused. Danger Zone sees players bombed with blasts of sound which forces them to always be on the move. The biggest new inclusion though is the special Heatmap. This shows players which are the most visited locations in Wildlands and shows areas that may need a bit more love from players. Wildlands Year 2 Pass holders have had access to Special Operation 4 from February 28. Today, it’s open to all players. Ghost Recon Wildlands is available for PC, PS4 and Xbox One. Have you suffered enough from lousy equipment and limited resources in Ghost Recon Wildlands that negligibly small to help you thrive in all competitions? Are you running out of time to farm and harvest due to the busy schedule? Well, here is the savior for you to meet - Gamefo. Gamefo GRW store provides the most resourceful products with reasonable low price and generally-30-minute delivery. If you look for buying GRW Credits and Digital Contents, Highly recommend MMOAH Fortnite store. View more details or purchase now through clicking Ghost Recon Wildlands Credits or GRW Digital Contents.